Oh we are in China by the way, for a wedding, but while I’m gone I thought I’d share a couple of my favourite recipes with you. Upon my return I will attempt to cook some delicious Chinese dishes inspired by out trip. This mouthwatering spring salad has to be one of my all-time favourites, because it tastes so refreshing and is very quick to make. Plus it’s a great all rounder, it makes a great breakfast, lunch or even light dinner meal. 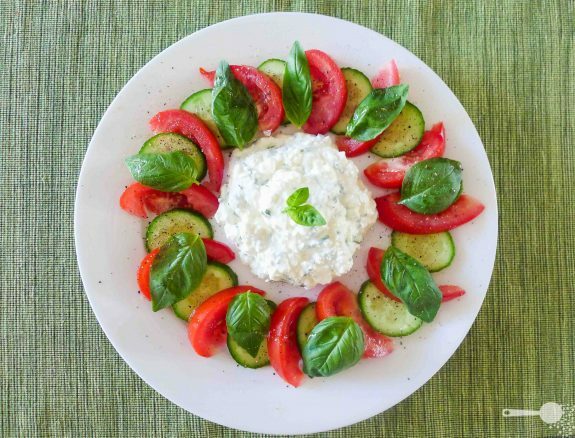 While traditionally, the Caprese salad is served with buffalo mozzarella, I like to use creamed cottage cheese instead. Smeared on some freshly baked, still warm sourdough it makes for a great meal on warmer days. The cheese has got a great texture and a slightly salty flavour, and it’s creamy enough to make for a nice moist ‘dressing’ on the tomato salad. Since all of the veges and herbs used in this recipe are coming into season, you should be able to get the best flavours on a budget. To make the herbed cottage cheese: add chives and basil to the cottage cheese and mix until well combined. Scoop the mixture into the middle of the plate. To serve: arrange tomato wedges and cucumber slices around the edge of a large dinner plate, alternating. Arrange basil leaves around the plate on top of the ‘salad’. Drizzle with some olive oil and sprinkle with freshly ground black pepper. I knew the cone would have a lasting impact. This looks fabulous. HAHAHAHA, that’s hysterical that you’re still in that mindset “can I make it in a cone?” I must say, your creativity is super impressive! This looks like something I would love! And fantastic presentation too. Caprese is one of my all-time favourite salads. I like your take on it here! This looks delicious–and easy to make! I’ve never looked into adding spices to cottage cheese. I can’t wait to try this! It looks like a delicious Polish-Italian fusion salad! I am wondering what basil tastes like with cottage cheese (chives have been tested of course hundreds of times). Sounds light and delicious. Safe and enjoyable travels! That’s so funny, but totally understandable. i am assuming you are seeing cone shaped possibilities everywhere. Enjoy your travels. Ooh! Looks great, Martyna – I actually grew to like cottage cheese in college, and yet haven’t eaten it so often recently. Your beautiful presentation has reignited my interest! Very interesting that you used creamed cottage cheese and I’d love to try it. I love the presentation of this salad – so pretty!